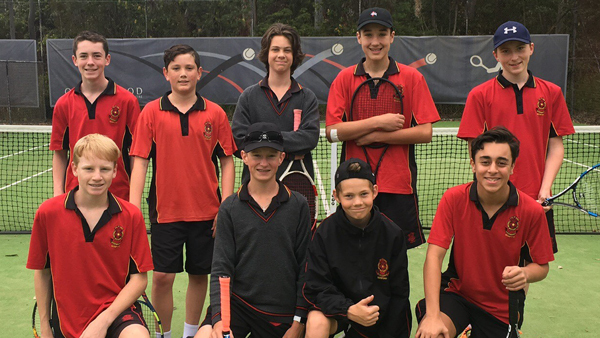 On Monday 29 October three teams of tennis players travelled to Oxford Falls in Sydney to represent St Edward’s at the BBSSSA Tennis Championships. These teams were Under 14’s, Under 17’s and a new ‘Champions Division,’ whose winners would go on to compete in a state-wide competition representing Broken Bay in 2019. Unfortunately this year’s competition clashed with a number of other events meaning that our most senior players were unavailable to represent the College but our junior teams really stepped up to fill the void. Both the Under 14’s team and the Under 17’s team had a really competitive day reaching the semi-finals but being narrowly defeated. Our standout team on the day was the Champion’s Division team comprising one Year 7 student and two Year 8 students who went on to defeat much older and more experienced teams to become overall winners. They will now represent the College in Bathurst next year. The Championship Tennis Team of 2018, arrived at Oxford Falls, some for their second time. We all had high hopes for the day, and were feeling confident going in to the first few matches, which we won easily. Due to the luck of the draw the next few matches turned out to be hours later, and we needed to regroup before returning to the court after such a long break. We won our next few matches convincingly, only dropping a couple of sets, and before we knew it, we were in the finals against MacKillop, which we won 2-0. Thanks to Adrian’s strong backhand, Max’s movement and defence skills, and Adam’s powerful forehand, we were able to make it through the day being undefeated. On behalf of the team, I would like to thank the people who ran the day at Oxford Falls, Mr Bell who offered to drive us down out of school hours, and to Mrs Englund, who managed the team.